I took my first Bus Stop and Crosswalk shots on March 1, 2010. I had a new 85mm f/1.4 lens and wanted to see how well it performed at night. That was my only goal. I also had an idea to walk up to a street about a half mile from my office that I knew had a pipe venting steam from below ground into the air, and I wanted to get a shot with that in it. That particular shot never really came out the way I wanted, but on the way there I kept on testing the lens. The people standing at bus stops were standing still. So were the people waiting for the light to change at the edge of a crosswalk. Both groups of people had a certain air of interest, the sort of private moments in public spaces that makes street photography so rewarding. I came up the idea for a series that night, and worked out details over the next few days. I posted the first Bus Stop image on March 5, and the first Crosswalk on March 9. On April 9 I announced that I would double my output and post 2 bus stop and 2 crosswalk shots each week. In the past year I sometimes pulled back to one of each in some weeks, but always posted a Crosswalk every Tuesday and a Bus Stop every Friday. April 8, 2010, the day before, was also the last time I failed to post at least one image here, meaning I have now gone 365 days of posting daily images. I didn’t even plan the coordination of the milestone with the anniversary. It just worked out. Finally, don’t forget that to celebrate Crosswalk 100, Bus Stop 100, and 365 days of consecutively posting at least one image daily with my fans, visitors, and supporters, I’m going to give away either a print or a book to one person randomly chosen from among those who have “Liked” my Facebook photography page. Today is the last day to enter. If you have already Liked the Page, you are already entered. If you have not already done so, you can enter by clicking the link and hitting the Like button while logged in to your Facebook account, or you can do the same thing using my Facebook Fan Page widget to the right. I will pick one winner at random, tomorrow morning, and that person will have a choice of either getting a free copy of my not-quite-ready book, or a comparably priced print of his or her choice. The book should be ready to go in about 2 weeks, and I hope to have an online preview ready to share with the winner on a sneak peek basis in a couple of days. The book will not include images from the Crosswalk or Bus Stop series, but will instead include my HDR images of New York City, usually devoid of people. Congrats Mark! Great ccatching the lady behind the post! Love this series and looking forward to another 100 posts! Great shot. – Gotta love those shoes. Congratulations on the 100/365 posts combo. Really nice capture here to cap it off! 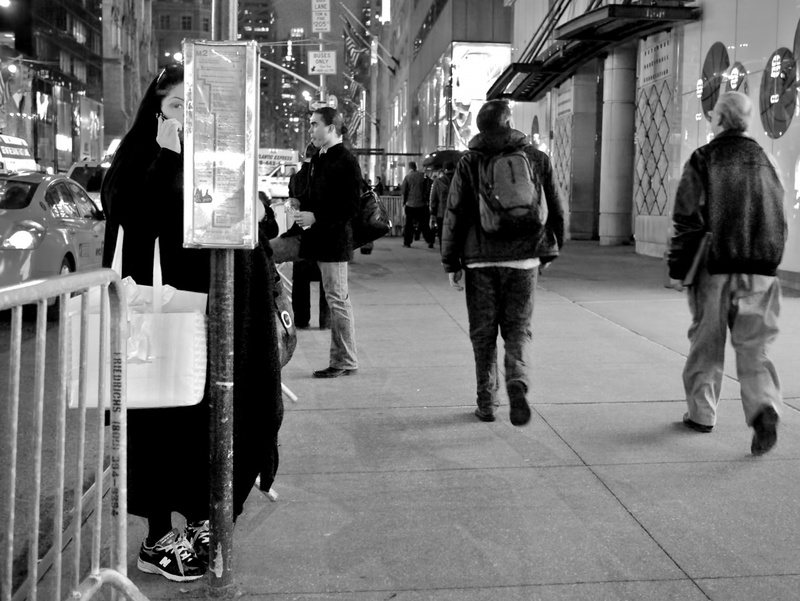 This and the crosswalk series actually inspired me to try out some street photography last night. Was quite fun, and gave me an additional layer of respect for your work! Do the people you photograph ever ask questions about having their photo taken? If so how do they respond? Tobias: nobody has ever approached me, and from what I gather, that’s a bit unlikely given how much I have shot in the street. In reading other street photographers, the reaction seems to be that most people will calm down after you explain what you’re doing, and it helps to have a business card with your website listed. Some of those people might want a copy. The vast majority of the remainder are mollified if you offer to delete the image with them in it, and almost every photographer I’ve seen weigh in on the subject agrees that it is a good idea to make the offer and to delete, even though legally (depending on the local law) you might have the right to keep it. From what I’ve read, very few situations are not diffused by either of these two approaches. But again, I’ve been fortunate not to have any such experiences. Very cool. I really need to get out and shoot some street with you in NYC. It just looks very rewarding. Great image! Next time you come to NY, definitely contact me. If looks could kill! Did she come after you with that giant bag? Love the street moments that you capture – timing really is everything! Congratulations Mark and great job! I’m excited to see what you come up with next. Love this one! Great catch! Mark, the Bus Stop and Crosswalk series have been inspiring, both from the compositional perspective and from the technical aspect. Keeping to a regime of posting every day is admirable, but it’s got to be a daunting task and if you miss a day or two here and there, we will still appreciate everything you share with us. Congrats on 100 on this series as well. I love the image you finished it off with. Absolutely great capture Mark! Congratulations on making it over 365 days. Although I seldom mention it on my site, it definitely one of my personal goals. I started my site less then three months ago, and I feel I have grown so much by forcing myself to review, process, and post a new photo everyday. I was thinking maybe in a future post you could talk about things you have learned or anything that helped you out all the way to achieving the one-year.